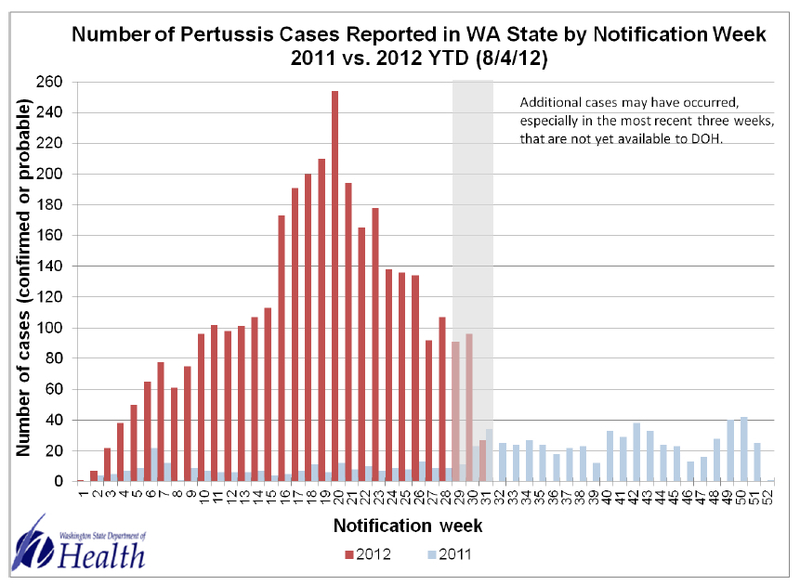 The Washington State Department of Health is reporting that as of August 4, 2012, the current whooping cough (Bordetella pertussis) epidemic has hit 3400 cases, over 15X more than the 214 cases reported at the same time last year. The epidemic has finally shown a big drop off in new reports this past week (pdf), although there are concerns that the numbers will increase against this fall as children return to school in the autumn. Of course, this epidemic is causing reexamination of our pertussis vaccines, which is an important future research direction. As I discussed previously, Tdap and DTaP vaccines seem to be showing a reduced protection over time. 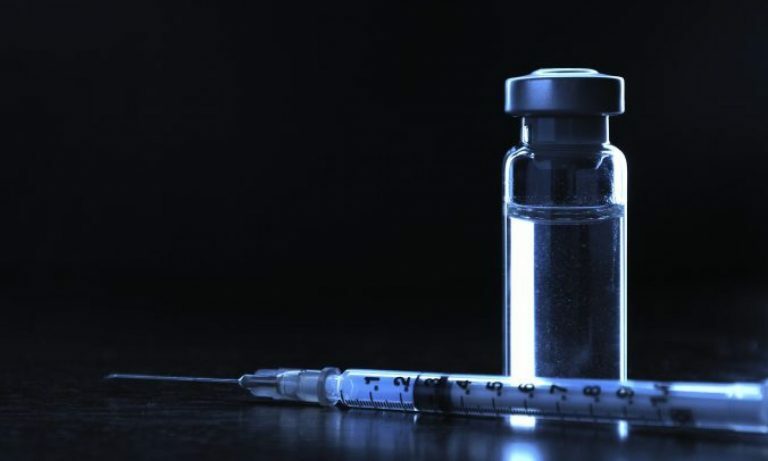 The CDC and FDA probably are examining new recommendations on vaccine intervals and development of improved vaccines. But clearly protection from a highly effective vaccine is substantially better than no vaccine at all. The antivaccination movement is already pushing the fact that the pertussis vaccine isn’t working so don’t get it. That’s such an insane idea, since the vaccine is at least 84-85% effective (and epidemiological studies seem to indicate a higher level) in preventing whooping cough. Given the risk of death and serious side effects from the disease, and little or no adverse effects from the vaccine, it’s an easy choice. But still, the vaccine denialists want to use this epidemic as their “proof” of vaccine’s failure. Joe Mercola, Salesman-in-chief of junk medicine, wrote an article about it, and then confusing pertussis, a bacteria, with a virus is not leading me to confidence that he actually knows anything about medicine. Or that he claims “vaccines cause mutations” which shows his complete ignorance about the mechanism of evolution. Seriously, if you can’t get the basics of biology right, how can we seriously accept anything else he writes. He also tries out the “recombining of live attenuated viruses” that I debunked. I’m just an amateur blogger and I can rip apart his exaggerations, imagine what the real doctors say about Mercola. As we can see, more un/undervaccinated children have been infected with pertussis than fully vaccinated across all age bins. This translates to children ages 5-9 un/der vaccinated children are 6 times more likely to become infected with pertussis than fully vaccinated. Children ages 10-13 un/der vaccinated are 25 times more likely to become infected with pertussis than fully vaccinated. And un/der vaccinated children ages 14-18 are 6 times more likely to become infected with pertussis than fully vaccinated. Is that clear to the vaccine denialists? Don’t vaccinate and your children are significantly more likely to get whooping cough. Don’t vaccinate, and there’s a significantly greater chance that your children could end up in a hospital. And a greater risk of dying. This risk is not higher with those who vaccinate, and if you thought that it was, then your understanding of statistics is at the same level as it is with Mercola’s understanding of evolution and virology, which is at zero.